Chronicling the history of the Reptilian Empire’s influence on Earth and their conquest of 21 star systems, Kasten reveals how the human race is enmeshed in a skillfully concealed plot to enslave humanity and exploit our planet’s physical and biological resources. Revealing Hitler’s pact with extraterrestrials and the Reptilian influence on the Nazi state, he shares new documents that disclose the rescue and rehabilitation of Nazi war criminals to assist in the Cold War, which then corrupted many U.S. government institutions. Focusing on crucial events in the decade after World War II, he examines the Reptilians’ human allies, the Illuminati, who control the levers of financial, technological, and military power throughout the world through various secret societies. He shows how Eisenhower’s treaty with the Greys, signed at Holloman Air Force Base in 1954, gave the aliens permission to take humans up to their spaceships—ostensibly for genetic study—in return for alien technology, and how these abductions led to the creation of a hybrid race under Reptilian mind control. He also explains how Kennedy was assassinated by the CIA because of his plans to rout out this Nazi–Reptilian presence. Contrasting the Reptilians with the benevolent Ebens, the aliens from Zeta Reticuli who crashed at Roswell, Kasten exposes the stealthy tactics of the Reptilians, their relationship with the Greys, and their advanced genetic bio-technology and teleportation abilities—as well as what we need to do to defeat their plans. 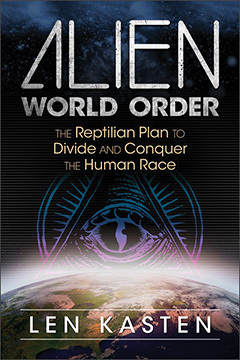 ALIEN WORLD ORDER: The Reptilian Plan to Divide and Conquer the Human Race By Len Kasten. 336 Pages. 6x9 Paperback.